Water is a precious and expensive resource, but it can be a pernicious threat if it shows up in the wrong places in your home, especially in an uncontrolled fashion. 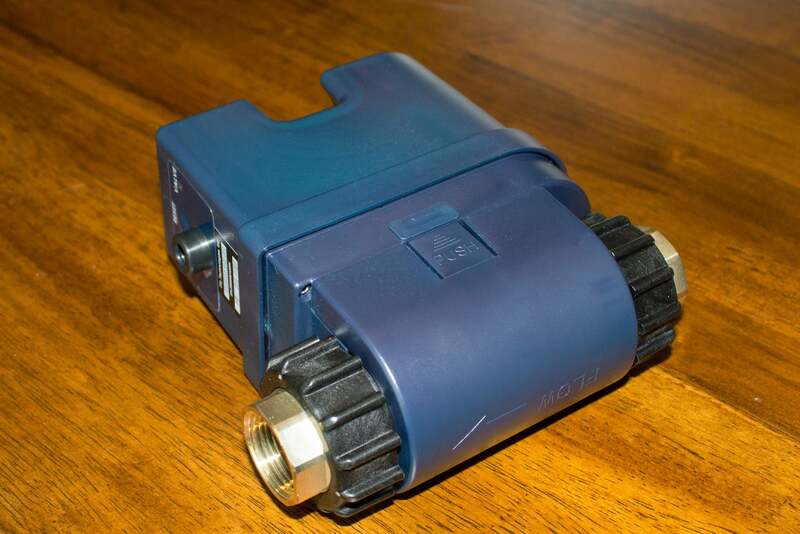 I’ve been testing the Flo by Moen smart water valve for the past several months and can say it would have saved me a lot of time and money had I installed it several years ago. But it’s not perfect. And it’s certainly not cheap. At its most basic, Flo will detect and warn you about a water leak. It will also shut off your main water supply in the event of a catastrophic event, such as a burst pipe. That’s a scenario I’ve experienced personally. A pipe in my garage ceiling froze and burst one winter while my wife and I were traveling. We returned several days later to find the interior of our entire garage destroyed, with water still spewing from a less-than-one-inch-long split in a copper pipe in the ceiling. Updated February 8, 2019 to report that Flo Technologies has formed a strategic partnership with Moen and renamed this product Flo by Moen. Every square inch of drywall was soaking wet, with so much water in the ceiling that it looked as though it was raining inside (see photo, below). Most everything we had stored in the garage, including some antique furniture, power woodworking tools, and gardening equipment, was ruined. The garage-door openers and all the lighting fixtures had to be replaced, too. Our final insurance claim exceeded $28,000, and it took months to get everything dried out and replaced. If we’d had a smart valve installed then, there would have been much less damage. A water pipe that froze and then burst while the author was away from home for several days resulted in more than $28,000 in damage to the structure and its contents. Flo consists of a motorized valve that you install on the main water supply line (1.25-inches or smaller) coming into your home. You can do this yourself, if you’re comfortable cutting the pipe that supplies your home with water, but Flo recommends professional installation. I didn’t want to take any chances, so Flo sent out a professional plumber for the job (installation is not included in the $499 price of the product). Flo has a 2.4GHz Wi-Fi adapter onboard, so it’s essential that you have a strong wireless router that can extend your network outdoors. In my case, I have a three-node Linksys Velop mesh Wi-Fi system, with an access point in the master bedroom. The main water supply line is on the other side of one of the bedroom walls, so my Wi-Fi signal was plenty strong to service the valve (there is no hardwired ethernet option). You’ll also need an AC outlet near your supply line to power Flo’s motorized valve and its Wi-Fi adapter. The Flo smart valve is fully weatherized, and it has an inline power brick, so the electrical plug at the end will easily fit inside a bubble-type outdoor receptacle cover. I elected to plug it into an outlet inside the exterior closet where my tankless water heater is installed. If your home doesn’t have an outdoor outlet nearby, you’ll need to figure out how you’ll power the valve. If you decide to install an outlet, be sure to use a GFCI (ground-fault circuit interrupter) model for your own protection. 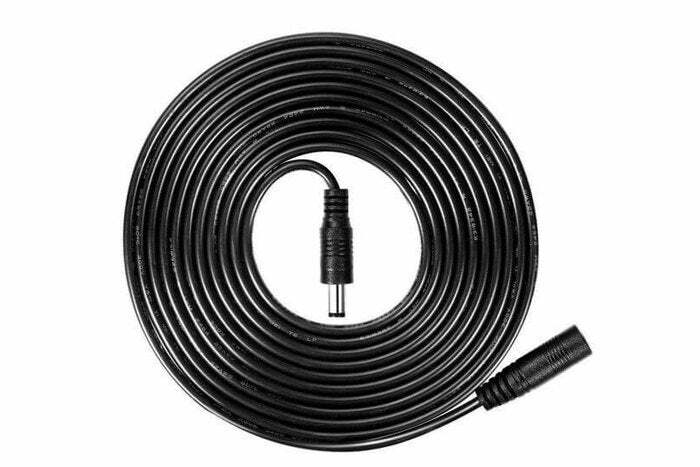 Alternatively, Flo offers a certified 25-foot extension cord for $12 (you can use up to four of these together if you really need to). If your water line is far from an electrical outlet, you can connect up to three of these 25-foot extension cords to reach an outlet. Sensors inside the Flo valve measure water pressure, water temperature, and—while water is flowing through the valve—the rate at which water is flowing (measured in gallons per minute). The valve will also perform a daily “health test,” during which it shuts off your home’s water supply and then monitors for any drop in water pressure that would indicate water is leaving your pipes somewhere beyond the valve. The test is typically performed in the middle of the night or some other time when Flo’s algorithms have learned that you don’t typically run water. If you do turn on a faucet, flush a toilet, or what have you while the test is underway, the test will stop and the valve will reopen, so you’re not inconvenienced. 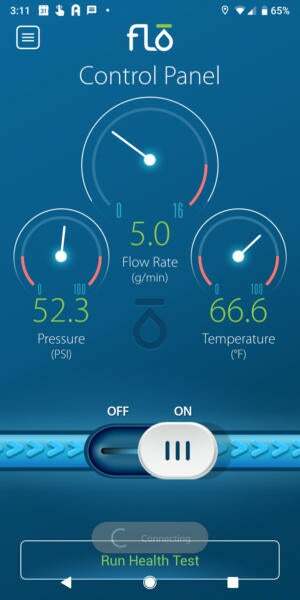 The Flo control panel reports on your home’s water pressure, water temperature, and current flow rate. If you suspect a problem, you can shut off the valve from here. All this information is sent up to the cloud and back down to the Flo app on your Android or iOS device. A number of scenarios could cause those measurements to get out of whack: Say water pressure drops too low, indicating there could be a problem with the water source, or too high, putting stress on your water pipes; the water gets too cold, putting your pipes in danger of freezing (a frozen pipe will also cause water pressure to build); or water flows at an usually high rate, indicating the possibility of a broken pipe. Such events would cause Flo’s servers to send a push notification to the app. If water flows too fast or for too long, you’ll also get a robo call from Flo headquarters warning you that there might be a problem and that the Flo device will automatically shut off your water main if you don’t respond. If you’re home at the time and know nothing is wrong—perhaps you’ve been watering your garden or washing your car, for example—you can simply press 2 on your phone’s keypad to delay the shutdown for two hours. If you’re not at home and think there might be a catastrophic problem, you can either close the valve from the app or wait a few minutes and let Flo do it for you. If I’d had smart valve like Flo installed when my pipe burst, it’s a near certainty I could have limited the amount of damage done to my garage and its contents. It’s difficult to say with precision how much less damage the leak would have caused, however, because Flo doesn’t react instantly. And you wouldn’t want it to, because it would otherwise drive you crazy with false alarms. 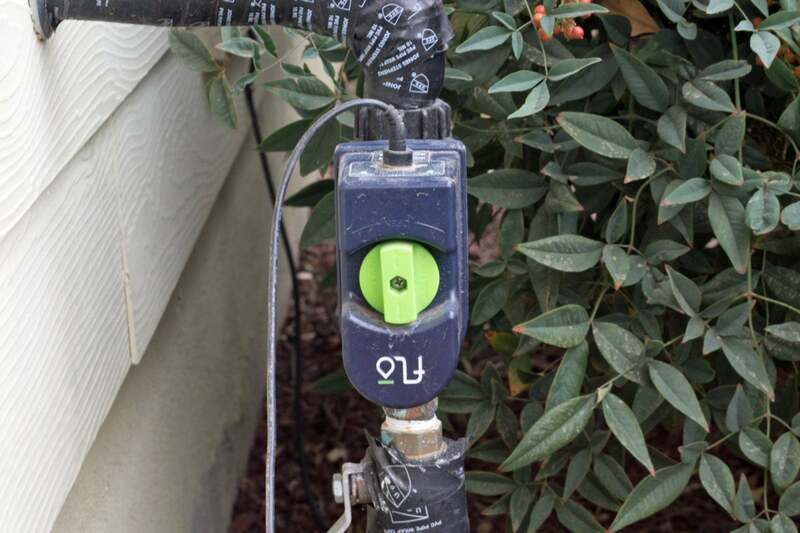 As it is, I experienced a number of those during my several-month test of Flo, mostly because I didn’t have a programmable irrigation controller for my landscaping during most of that time. Flo’s algorithm relies on predictable patterns, and I tend to be haphazard when it comes to watering my landscaping. My house is in the middle of a five-acre lot (subdivided from a 10-acre lot that was once a dairy farm). I don’t have a traditional lawn, but I do have lots of trees, rose bushes, and shrubs. I used to water these with a drip irrigation system, but ground squirrels chewed holes in the plastic hoses. I’m now watering with a sprinkler attached to a hose until I can figure out a more permanent, squirrel-proof solution. I try to remember to put Flo into its “sleep” mode before I do this, to prevent the valve from triggering the robo call, but I’m not always successful. My main water line is vertical, which resulted in the Flo being installed upside down in order for the water to flow in the proper direction. Fortunately, the power connection is water tight. If you know you’re going to be away from home for a stretch—on vacation, for instance—and won’t be using much water at all, you can put Flo into “away” mode. In this state, the valve will respond much more quickly to abnormal events. The smart valve is only half of the Flo story. You can use the Flo app to set water-usage goals and track your water usage against those goals on a daily, weekly, and monthly basis. The app will issue alerts whenever there’s high or extended water usage, when leaks are detected, when the valve goes offline (such as might occur during a power outage, for examples), and for other important events. These alerts are logged in an activity report along with the results of the daily health tests. It’s important to note here, however, that Flo can’t tell you exactly where water is leaking from. During my evaluation, Flo accurately reported a small leak in my plumbing system, but it was up to me to track it down. The culprit was a worn-out flapper on the toilet in my guest bathroom, but since the bathroom is right next to my home office, I’d heard the toilet running even before Flo reported the problem. Finding a leaky indoor faucet probably wouldn’t be too difficult to locate, either, but a leaky hose bib outside the house would be much more difficult to pinpoint. The direction of water flow is indicated on the Flo’s housing. When you install the Flo valve, the app will ask you to build a profile of your home by answering questions about the size of your home, how many floors it has, what amenities it has (such as the number of bathtubs and showers, and if you have a pool or a hot tub), if you have a dishwasher, if your efrigerator is equipped with an icemaker, and even if you have a tankless water heater. It will then suggest a water-usage goal. 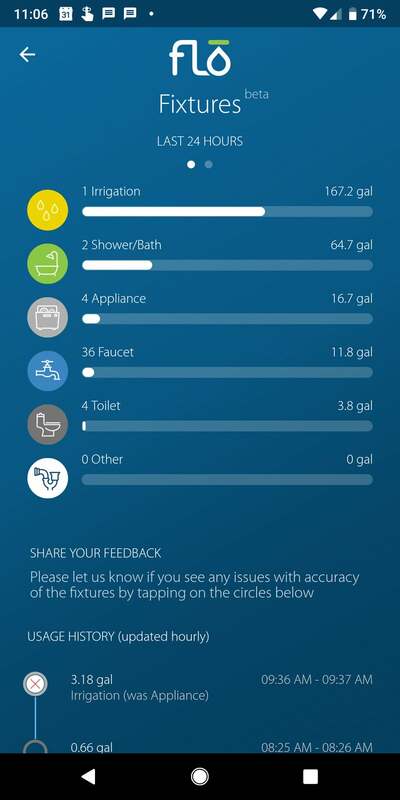 With two people living in my home, the Flo app suggested a goal of 240 gallons per day. That’s in line with the US Geological Survey’s estimate of 80 to 100 gallons of water consumption per person per day, but I found that my home routinely uses more than that on the days I water my landscaping. You can set your own goal to whatever you think is appropriate and track it accordingly. Flo offers an optional subscription service, FloProtect ($5 per month), that provides even deeper insight into your water usage. It also provides four other benefits. The primary feature, dubbed Fixtures (which is still in beta), promises to analyze your water consumption by fixture, which should make it much easier to hit your water usage goals. Fixtures analyzes the patterns of water flow to identify just how your water is being used: How many gallons are used to flush toilets; how much pours through your faucets, showers, and bathtubs; how much water your appliances (washer, dishwasher) use; and how many gallons are used for irrigation. Fixtures is included in the optional FloProtect subscription service. It strives to identify how you use water. The algorithm wasn’t very useful in the beginning and would just lump most of my water consumption into the category of “other.” But after helping the app identify my consumption patterns—the app updates your water usage hourly, and you can reclassify each event—it quickly became more accurate. It’s still not perfect, but it’s pretty close, and it helped me realize I was probably wasting too much water on irrigation. The $60-per-year subscription also entitles you to a reimbursement of your homeowners’ insurance deductible if you suffer a water damage loss (capped at $2,500 and with a passel of other restrictions you can read about here). The rest of the benefits are a bit squishier: You get an additional two years of product warranty (a one-year warranty is standard), you can request a customized letter to present to your insurance company that might qualify you for a discount on your premium (if your insurance provider offers such a discount), and you qualify for proactive monitoring by a “water concierge” who can suggest solutions to your water issues. Is Flo a worthwhile investment? Flo isn’t the most expensive automatic water shutoff valve on the market. Phyn Plus costs $850, and Buoy costs $515, plus a mandatory $18-per-month subscription after the first year (we’ve yet to review either of those products). But $499 is a significant investment. It’s also worth mentioning that Flo doesn’t tie into sensors that would directly detect the presence of water where it shouldn’t be, such as on the floor from an overflowing sink, bathtub, or toilet; or from a leaky or failing dishwasher, washing machine, or hot water heater. And a lot of water can escape from a burst pipe before Flo will sound the alarm or act on its own if you don’t. On the other hand, most homes are at far greater risk of water damage than from fire, weather, or earthquake. Detecting and stopping a catastrophic water leak could save you a lot of money depending on your insurance deductible; perhaps more importantly, it can prevent the loss of personal possessions and the huge disruption to your life that a burst water pipe can cause. Detecting smaller leaks can save you money on your monthly water bill, too; not to mention reducing your impact on the environment.